Happy Monday Friends! Today's post is a little shorter and sweeter than usual. I have longer posts on the way for later this week (the second post in my moving out of state series is on deck for tomorrow) so we'll just chat fashion today. But I am super excited to share this outfit with one of my favorite dresses- I know this will be a staple in my closet for awhile! There was a 50% off sale at LOFT a couple weeks ago, so I popped into the Charlottesville store one morning on my way to work. I loved so many of the LOFT new spring arrivals!! Their dresses for this season are especially cute and classic. Even though I work in radio, an extremely casual industry as far as dress codes go, I still like to look presentable and put together for work (it helps me to focus better on-air! ), and in the spring/summer I wear dresses many days to work. As soon as I laid eyes on this dress, I knew it had to come home with me! It's pretty much the ideal spring dress. It can be dressed up for a more business casual workplace (doesn't it look nice paired with my black blazer? ), but could easily be dressed down with a different hairstyle and shoes for the weekend. It's very flattering and accentuates your assets while still being modest... so a win-win in that department! I tried on several other things, and this top and this dress I also really liked! I wrote a blog post a few months ago all about my favorite stores and what items I usually buy from the stores I shop at. I wrote in the post that I think in some seasons LOFT's collections are a bit "basic" and especially oversaturated in the blogging world... but with that said I really am loving their spring stuff this year! It's worth a look for sure! Wishing you a great start to your week today! Mondays and Fridays are shaping up to be my busier days of the week at my new job (busy start to the week and busy end to the week). I also have a lot to do this morning for the blog and things around my apartment before heading to work- but I like productive Mondays so bring it on! OH- before I forget, I had a surprise Saturday blog post this weekend! 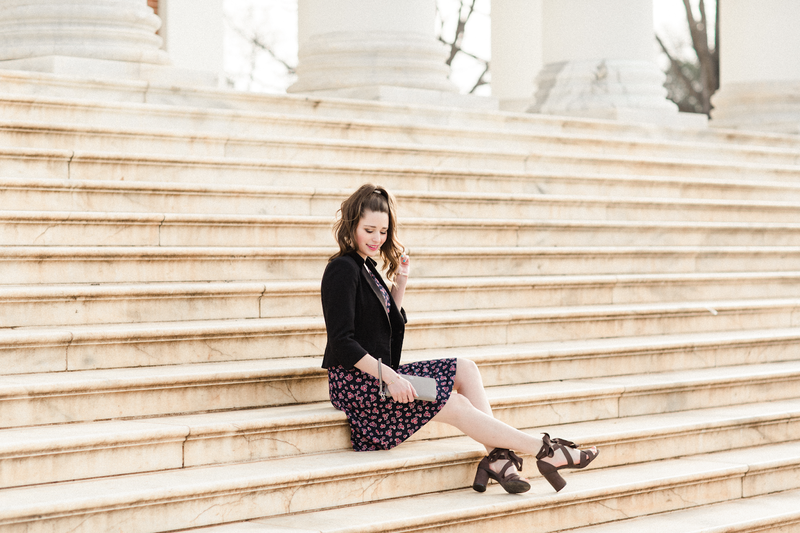 Sharing one of the details about one of the outfits that I wore in DC for Easter Weekend- check it out here. That dress is so pretty! A perfect "wear everywhere" dress! wow this dress is gorgeous and looks perfect for just about any situation! This dress is so cute on you! I have always loved LOFTs stuff. Such a classic piece and definitely something you will have for years! Looking so pretty friend! ahhh such a pretty dress! can't wait for tomorrows post in your moving out series!! That dress is perfect for spring! Love it. You look too cute! Love the dress on you - so flattering! This is the prettiest dress on you! And I love how you styled it for both work and weekend wear! 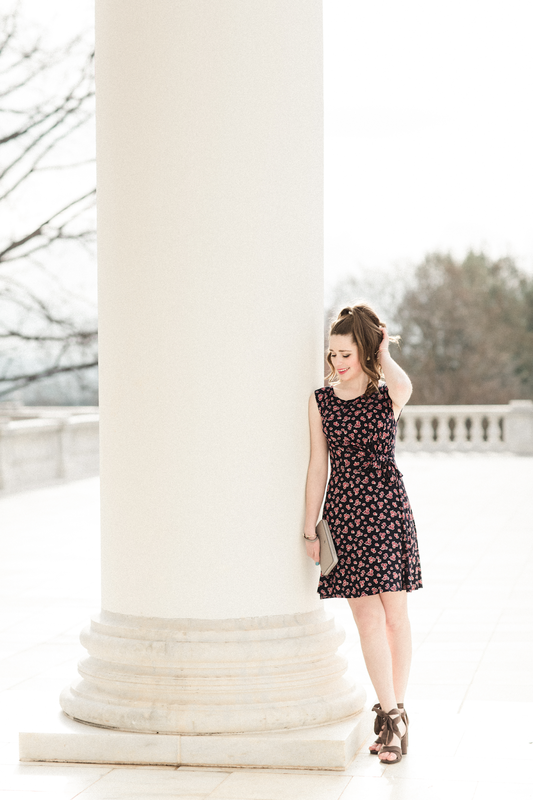 Multipurpose dresses like this one are definitely the way to go! I love how you can change up the accessories, hair and makeup and create a whole new look!